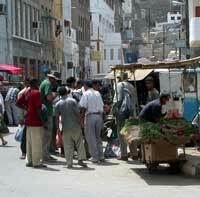 Back in Salalah we checked out the old market which now caters principally to tourists. 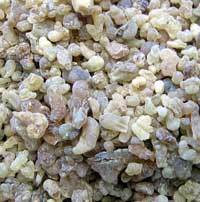 Vendors in cramped stalls sold scarves, frankincense, perfumes, hats, dates, … Frankincense crystals are hardened sap used as air freshener and deodorant. The crystals are placed in a small dish over an open flame. As the smoky fragrance rises it is swept up under clothing and towards the face. Middle Easterners are really into perfumes. We discovered one whole shop that sold nothing but scented oils. 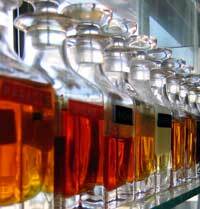 They had copies of all the major labels such as Dior and Lancome, or you could even create your own fragrance by mixing different scented oils. I think that Eau de Sarah of the Savage Seas should be a real hit! Maybe I need to work on the name a little more. 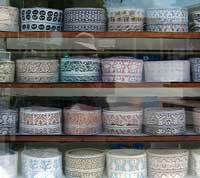 The Omanis make beautiful embroidered fez caps for men. The hats come in all colors and designs. What a cool way to make a fashion statement! And of course, the scarves and the abayas for women were gorgeous. All this shopping just wears a person out! 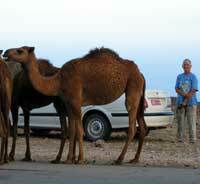 Oman was a fascinating place to visit. We had a great time in this beautiful country. It was a great introduction to Middle Eastern culture for me. I know that the Abbotts felt right at home here. After almost 2 weeks here, we are more than ready to head for the Red Sea. 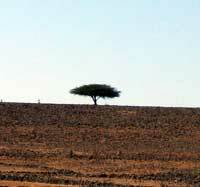 March 2-6, 2005 -- We left Salalah, Oman today. We are hoping for a good run down to the entrance of the Red Sea, also known as the Bab El Mandeb. Our top priority for this passage is pirate prevention. The Gulf of Aden is a hot spot for pirate attacks on both large and small ships. A few years ago a large cargo ship was boarded by Somali pirates. The ship along with all its goods completely disappeared. There are many stories of yachts being attacked by pirates. Usually the pirates take anything of value on your boat -- money, radios, cameras, GPS, radar … et al, but they have not harmed the passengers on the boat. The pirates are opportunists. If you happen to cross their path, they may make an approach. Your only chance of escaping is if you can out-sail them or take them into the path of rougher seas. We have been told that many pirates are actually people smugglers from Somalia. Their boats may be loaded with illegal refugees heading to Yemen. Thankfully, we have heard that the Coalition Forces are out in the Gulf of Aden and the Red Sea patrolling. So perhaps we will have someone to back us up. Our plan was sail right down the middle of the Gulf of Aden, keeping as far away from the coast as possible. We opted to not sail with a large group of other sailboats because this just increases visibility. During the day, someone would always be outside looking around for any small ships and the radar would be left on at all times. At nighttime, we decided to run without any lights. We would try to only sail at nighttime if there was any wind, again for visibility reasons. 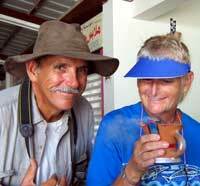 We headed out from Salalah with our friends, Richard and Cathy, onboard their boat, Balmacara. We maintained radio silence on the VHF and contacted each other via SSB (ham) radio. A couple of times a day we would check in with friends who had left a few days before us. The pirate prevention plan worked like a charm coming through the Gulf of Aden. We had no problems, except for the weather. It should have been a quick passage down the Gulf, but the wind decided to take a holiday. That meant slowly motoring down the Gulf, which unfortunately made us more of a target for pirates. Thank goodness, we saw few boats other than large cargo ships. A few of them even warned us about pirate attacks. Thank you, thank you, we know all about them! Let’s just knock on wood. 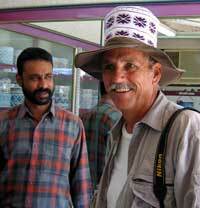 March 6-8, 2005 -- After a slow sail through the Gulf of Aden we entered Yemen at the Port of Aden. 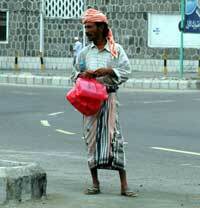 The funny thing is, we had never planned on stopped in Aden. But after 3 days of motoring and not a puff of wind in the sails, we needed to replenish our diesel tanks. This is the Aden of USS Cole infamy. We had some concerns entering a country like Yemen. 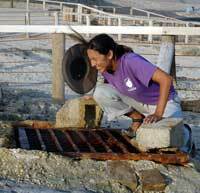 Would the locals be hostile or friendly? Would we be able to get the provisions we needed? We discovered that we had nothing to worry about in Yemen. It proved to be one of the friendliest countries that we visited. As we would walk along the street people would call our “Hello” and “Welcome to my country”. Granted, we didn’t exactly go around claiming to be Americans and having Dave around speaking Arabic was a definite plus. Yemen has a very colorful history. Queen Sheba supposedly was from this area and had her famous baths at local natural springs. The road to the Orient with its camel trains passed this way. The Romans came to Yemen to extend the reaches of their empire. In the north of the country are beautiful walled cities built from mud that are hundreds of years old. The port in Aden was established by the British in the late 19th century as a means to control boat traffic through the Red Sea. It is definitely one of largest naturally formed ports that I have ever seen. Surrounding the port were towering mountains which we were told are dormant volcanoes. One of the nearby towns is even called “Crater”. The mark of the British is evident here, from building design to signs in English. After the British left in the mid-20th century, the Communists moved in to fill the power vacuum. Essentially, Yemen became a pawn of the superpowers and for almost 15 years there was a civil war. It was not just political parties jousting for power, but also clans and tribes. Tribal loyalties still run deep in Yemen. There were many men walking around town with the traditional jambiyah dagger tucked into their waistband or an AK-47 casually tossed over their shoulder. The vibe here tells me that it would not take much for a full scale riot to break out. The people and the city of Aden bear the scars of the civil war with bullet riveted buildings, crumbling homes, and ancient cars. Public sanitation is non-existent here. There was garbage piled up everywhere. Goats and sheep wander freely through the winding streets. 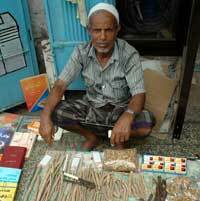 Young and old men lined the street chewing Gat, the local drug of choice. There they would be with glazed eyes and a loopy smile. Gat is a plant with mild sedative and euphoric qualities. The men would chew the green leaves like it was a huge wad tobacco and then spit out green goop onto the pavement. So watch where you step! Our arrival in a new place necessitated a guided tour. Salim, our tour guide, drove us around in his dusty 20 year old station wagon. 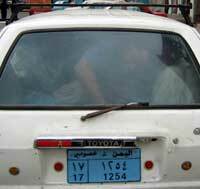 Since there were 6 people on the tour, Dave and Richard had to squeeze into the cramped jump seats in the trunk. Things started to get exciting when the trunk door would not open from the outside. Salim had to go around to a side door and cram himself into the back along with Dave and Richard! So there were these 3 big guys wriggling around in the trunk. Finally, after a few side-splitting and funny minutes, Salim managed to get the door open. Salim showed us the town of Crater that is built on the remnants of ancient volcano. In the hills surrounding the town, people have built homes right into the cliff face. This must be a step up from the caves that Yemenis used years ago. 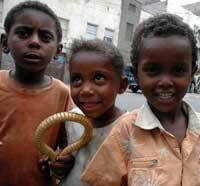 In certain sections of town, shanty towns had been established by the illegal Somali refugees. Salim told us that these refugees are a real problem here that the government seems unable to cope with. We encountered many Somali women and children begging for money and food. 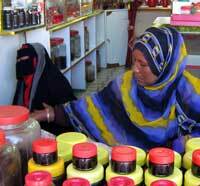 Unlike the Yemeni and Omani women who are covered from head to toe in monotonous black, the Somali women were veiled with brightly colored scarves. 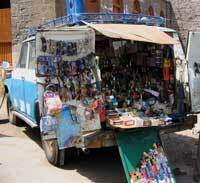 Salim took us to the large souq/market in Crater town. Here little shops lined the streets with the vendors coming out to take a look at this strange group of tourists. Just about everyone would yell out, “Hello, where are you from”? This we learned was the extent of their English and that Canada was a very good answer. You could buy just about anything you wanted in the souq -- fruits and veggies, pots and pans, electronics, tools … Some of locals decided that they were going to become our tour guide. They would hover and hang over your shoulder. They tried to show us around, introduce us to some of the local customs, and of course usher us to their friend’s shop! The final stop of our tour was a fascinating jewelry/antique shop. Here were many of the remnants from the British and Communist occupation of Yemen -- old fashioned record players, pots and pans, silverware, and statues … Additionally, the shopkeeper sold beautiful Bedouin jewelry and jambiyahs daggers. 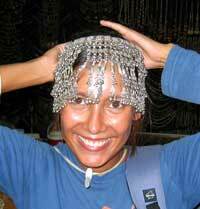 It was some of the most intricate and detailed jewelry that I have ever seen -- headpieces, veils, necklaces, anklets, bracelets … All this jewelry was handmade from silver with small bead-like pieces wrought together. 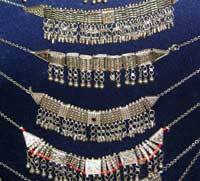 In the Middle East and Bedouin culture, a woman’s dowry and essentially her insurance policy if something in the marriage were to go wrong. So women often have very ornate and expensive pieces of jewelry. 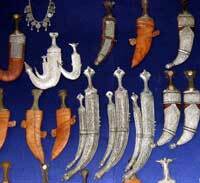 The jambiyah daggers had leather sheaths that were intricately decorated with silver and inlaid mother of pearl. Occasionally, as you would walk down the street you would see a man with a dagger tucked into his waistband. We all left with some really nice pieces of jewelry and few daggers after some hard bargaining with the owner. Basically any price they quote you divide by 50% and then start haggling from there. If you buy a whole bunch of stuff you can get some really good deals. I guess that you could say that I am becoming a bargaining pro!! 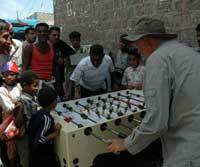 Our final adventure in Aden verged on being riotous! 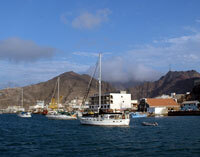 We explored the port town of Aden with our cameras. It was so funny to hear just about everyone asking to have their picture taken. 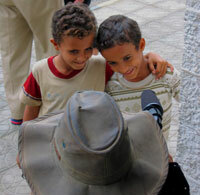 The little kids were fascinated with how the digital cameras provided a view of their smiling faces. They would clamber all over you trying to get a look at the screen. But it wasn’t just kids! Many of the young men would ask you point blank to take their photo, as if they were the one thing in Yemen that you should remember. It made for some really interesting photos. Dave struck up conversation with some of the locals. They were absolutely flabbergasted that here was this westerner who could speak Arabic. The fact that Dave showed genuine interest in their lives made for some very animated conversation. The more Dave talked, the more people crowded around. When the locals saw our video camera they thought they were being filmed for TV. Someone even yelled out that we were from Al-Jazeera! How is it that everyone wants to be on TV? As Dave was getting his shoe fixed by a local tradesman, there must have bee a crowd of 40 people gathered around asking for us to take their picture. We knew that things were getting a little out of control when a policeman approached to find out what all the excitement was about. So we subtly made our way out of the crowd and hurried back to the boat. Psst ... want to buy a watch?